Catriona Holden, Specialist Stop Smoking Practitioner for Pregnancy in Macclesfield, has just given out her first ‘Goodie Basket’ to one of her mums following the birth of her daughter. 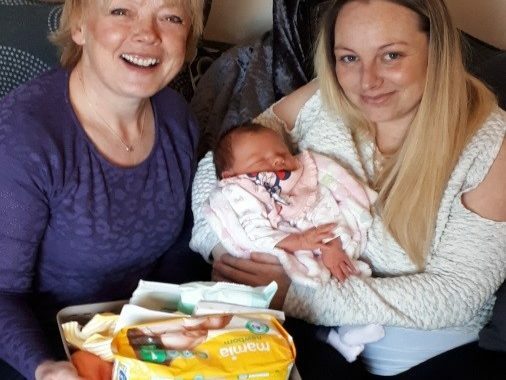 Kirsty, who quit smoking when she received support from Catriona at the beginning of her pregnancy, also received a ‘Goodie Basket’ when she had quit after 4 weeks. The ‘Goodie Baskets’ contain lots of useful products for during the pregnancy and then for when baby arrives. Kirsty remained smokefree throughout her pregnancy. ‘When I found out I was pregnant with my fourth baby, I quit smoking with the help of Catriona from the Kickstart Stop Smoking Service. I’ve had my baby now, a little girl we’re naming Calisha Marie. Both me and my partner Jonathan are both still quit and feel so much better for it’. – Kirsty Walker January 2019.